Brent Greer was educated in the public school systems of Tennessee. He received his Bachelor’s Degree with Honors in Business Management from the University of Tennessee at Martin. He is also a graduate of the Tennessee Young Bankers School at Vanderbilt University. 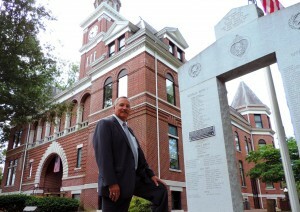 After a twenty-three year banking career, Greer was elected to his present office of County Mayor in 1998. During his terms as Mayor, Greer has served as a Director and Chairman of the Northwest Tennessee Development District and Human Resources Agency, Chairman and Director of the Northwest Tennessee Economic Council, President of the Tennessee County Services Association, President of the Tennessee County Mayor’s Association, Vice President of the Tennessee Development District Association, Vice Chairman of the West Tennessee River Basin Authority, and Director of the Paris-Henry County Alliance. Greer completed the Local Government Leadership program through the University of Tennessee and attained the designation as a Certified Public Administrator. He is also a graduate of the WestStar Leadership program. He and his wife Sarah have two children; daughter, Amy (and son-in-law, Jamie Kilpatrick); and son, Eric (and daughter-in-law, Stephanie). They have 6 grandchildren; triplets Houston, Elizabeth, and Madeline Kilpatrick; Twins Ethan and Ella and brother Mathew Greer.